Perfect for lunch or potlucks, this crowd-pleasing cold tuna pasta salad is the perfect balance of creamy dressing, tender pasta, and fresh crunchy veggies. Classics remain classics a very good reason, and tuna pasta salad is no exception. 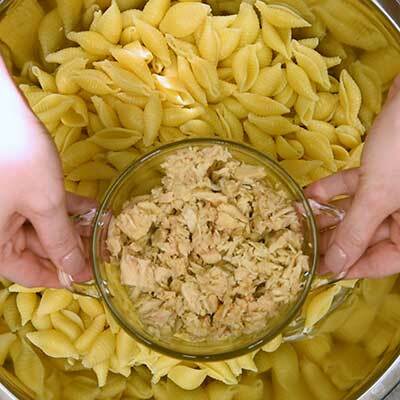 From the flavorful dressing to the mix of tender pasta and crunchy veggies, there’s bound to be someone who loves everything about what makes a tuna and pasta salad so delicious. That’s why it’s one of my favorite “I don’t know who’s going to be there” foods to whip up and bring to all types of gatherings, from potlucks to picnics to holidays. I personally prefer to use shell pasta with this recipe, and any size is fine – small, medium or large. The veggies have a habit of tucking into the shells of the pasta, making it easy to get the full flavor profile in just one spoonful. But if you’re looking for something different, you could also try elbow pasta or bow tie pasta. Do you have to use frozen peas? For this recipe, I highly recommend frozen or fresh peas. The goal is for the peas to be a little firm with a vibrant green color. You can use canned peas if necessary, but remember that they tend to be soft and more prone to breaking. You’ll lose some of the texture and presentation with canned peas. Can you make tuna and pasta salad in advance? Yes, you can make this in advance. In fact, this pasta salad will taste better once it’s had a chance to marinate in the refrigerator for at least an hour. Red onions can pack a bit of a bite, so if you’re looking for a milder flavor, try soaking the onions first. To do this, submerge the red onion in a bowl of ice cold water and let it soak for about 10 minutes, stirring occasionally. Drain the onions, pat them dry, and then use in the recipe as directed. Step 1 – In a medium saucepan, boil some salted water and cook the shell pasta to al dente (per package instructions). 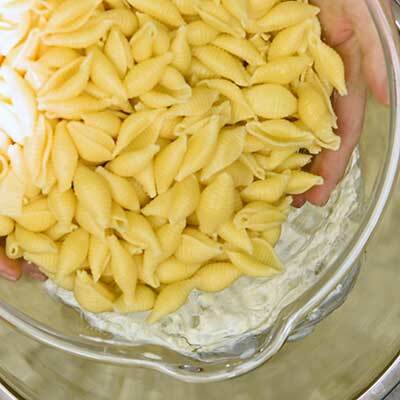 Drain the pasta and quickly drench with cold water to stop the cooking process, then set aside. 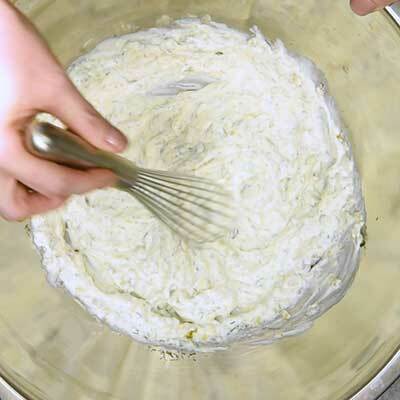 Step 2 – In a large mixing bowl (I like using this one), add the mayonnaise, pickle relish, dill weed, and garlic powder. Season with salt and pepper, to taste, and then whisk everything together. Do a few taste tests to see if you need to add any extra pepper or salt. 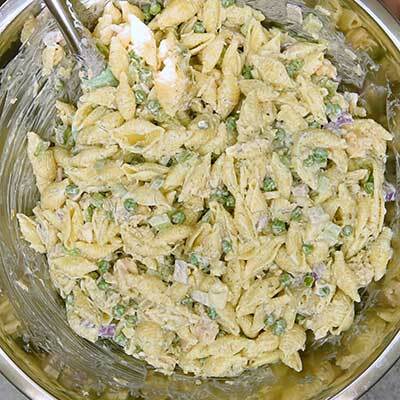 Step 3 – Toss in the cooked pasta, tuna, peas, celery, and red onion, then use a spatula to gently mix it all together. Step 4 – Chill for at least one hour. In a large saucepan, cook orzo per package instructions. Drain pasta and rinse with cold water, then set aside. 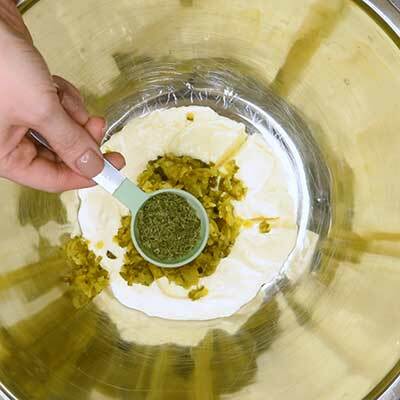 In a large mixing bowl (I like to use this 13 quart mixing bowl), whisk together mayonnaise, pickle relish, dill weed, garlic powder, and salt and pepper to taste. Add cooked pasta, tuna, peas, celery, and red onion to bowl, then use a spatula to thoroughly toss and mix ingredients together. I haven’t had a salad like this in ages! And I don’t know why, because I’ve always loved it! Your pictures are so amazing – especially the closeups – that now I’m craving it! This looks like a great recipe.